Get our latest recipes sent right to your inbox! Tasty Good Recipes You'll Love! 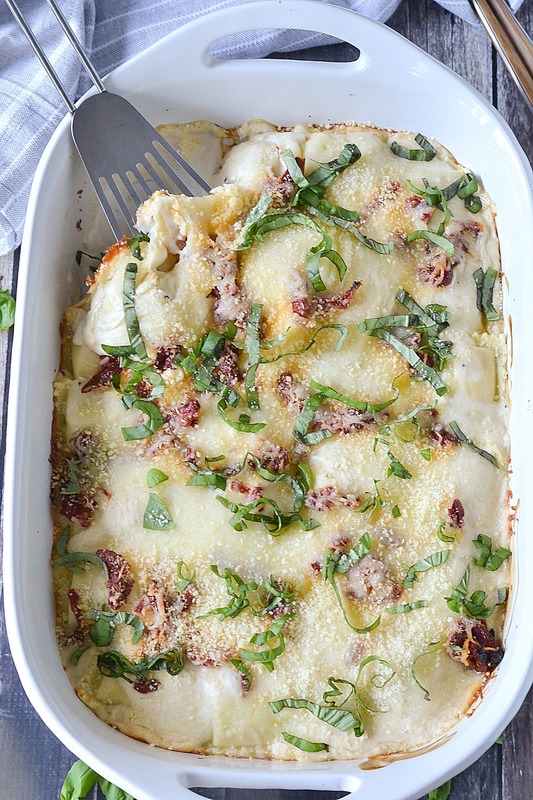 Get dinner ready in a snap with this delicious Creamy Sun-Dried Tomato Baked Ravioli. With just a few minutes of prep time and about 30 minutes in the oven you can have dinner ready in no time! It’s that time of year again – back to school. And with that comes busy weeknights filled with homework and after school activities. 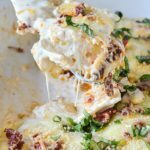 If you are looking for some easy and yummy recipes to make dinner time a breeze then this Creamy Sun-Dried Tomato Baked Ravioli is one to add to the list. With just a handful of ingredients most which you can keep on hand and a few minutes prep time you can get dinner in the oven and have the kiddos working on homework while dinner is baking. How’s that for multi-tasking? I love this meal because aside from basil all the ingredients are simple pantry or freezer items you can always have on hand. It’s a great recipe to keep handy so if you have one of those busy nights where you want to make dinner instead of ordering take out yet you’re scratching your head on what to make if you keep these ingredients on hand you’ll be set to go! It’s always good to have one or two backup meals on hand whether they are some freezer meals you’ve put together or easy meals like this so you’re never stuck on what to make for dinner. So what makes this meal so tasty? Pretty much everything. 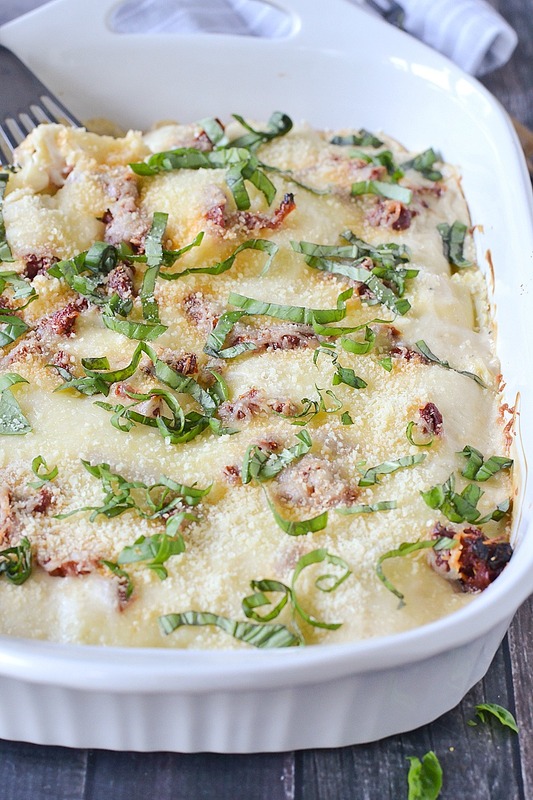 It’s creamy without being too heavy and the sun-dried tomatoes give it added flavor and texture. It tastes like delicious Italian restaurant style meal right in your own kitchen. If you’re up for it toss together a salad and even add in some breadsticks for a complete meal that is absolutely scrumptious! If you like this recipe you don’t want to miss these! 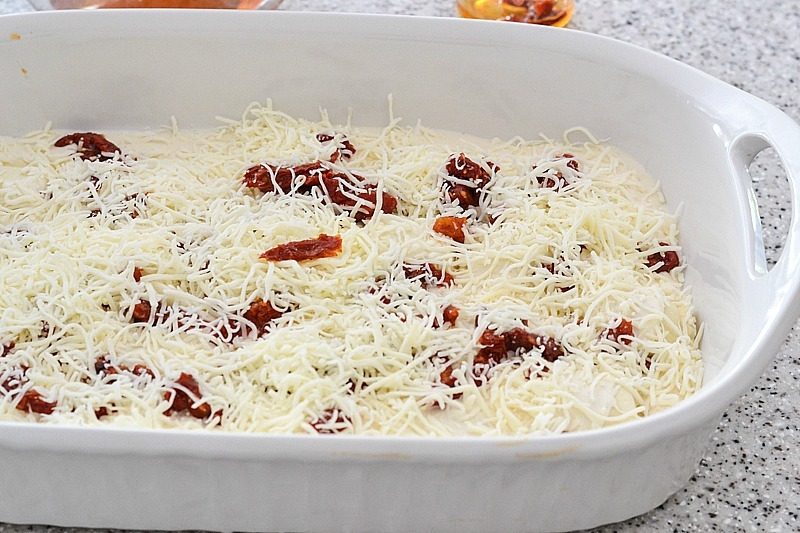 Spread 1 cup Alfredo sauce on the bottom of a 9x13 baking dish. Top with a single layer of frozen ravioli. 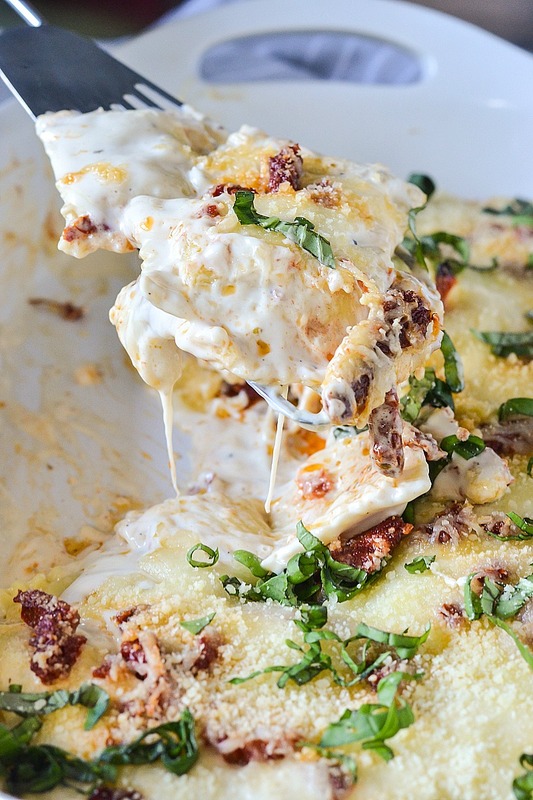 Top ravioli with 1 cup Alfredo sauce, then sprinkle with 1/2 of the sun-dried tomatoes and 1 cup shredded cheese. Repeat layer once starting with ravioli and ending with remaining 1 cup shredded cheese. Cover with foil and cook for 30-35 minutes until center is cooked. Remove foil and cook for 5-10 minutes longer until hot and bubbly. 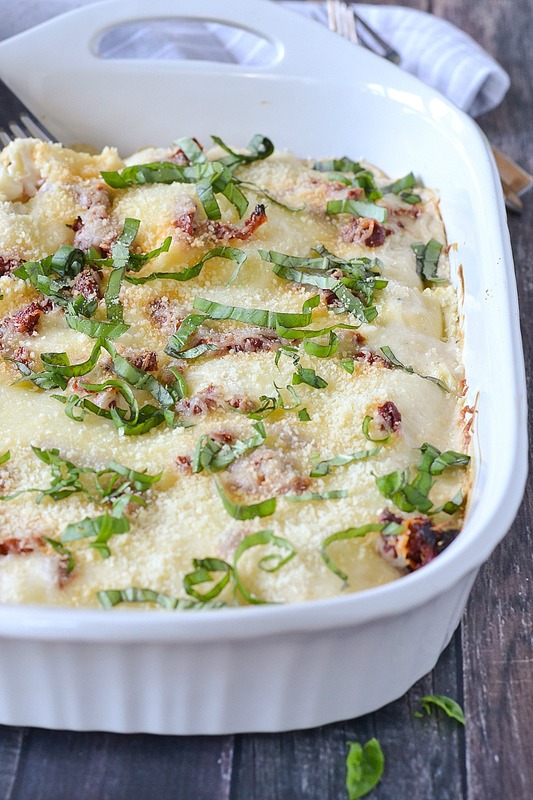 Sprinkle with grated Parmesan cheese and garnish with fresh chopped basil before serving. Hi there! I'm Jenn. A blessed mom of twins and the gal behind these recipes. I love good food, chicken wings and lots of coffee! All my recipes have to pass the test of my toughest critics, my family. From healthy eats to easy weeknight meals and irresistible desserts, I have a little something for everyone. Come hungry and leave with some recipes you'll want to make again and again! Get our latest posts sent right to your inbox! Have you tried this recipe? Share it on Instagram and tag us @MotherThyme + #motherthyme. I'm Jenn. A wife and a super blessed mommy of 7 year old twins. We live in beautiful western New York. I love good food, chicken wings and lots of coffee! Welcome to Mother Thyme! Hungry for more? Join our newsletter and get the latest recipes delivered right to your inbox + receive a FREE slow cooker ebook filled with 35 slow cooker recipes! All content and photography is © 2011-2018 by Jennifer Dempsey and Mother Thyme. Please do not reproduce any content or photography without prior written consent. All rights reserved.